The Hollywood Tower Hotel, more commonly known as The Twilight Zone Tower of Terror, is filled with enough eerie atmosphere to keep you glancing over your shoulders and peering around corners. Throughout the lobby, library, and boiler room there are many suggestions that you have crossed over into another realm, but the indications don’t end there, they follow the unknowing guests right into their maintenance service elevators. As with all elevators, the Hollywood Tower Hotel’s service elevators have been inspected and certified to travel. In the case of the Tower of Terror’s fleet of elevators, however, they have a peculiar permit that entitles them to travel directly beyond the fifth dimension into The Twilight Zone. 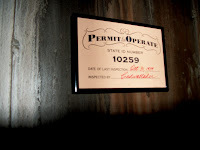 The Permit of Operation was certified on October 31, 1939, by an inspector named Cadwallader, with the permit number 10259. In the story of the Hollywood Tower Hotel, it was on the very day that the elevators were examined, October 31, 1939, that the unfortunate incident occurred that shepherded several hotel guests and the elevator they were traveling in into the Twilight Zone. This could be overlooked as coincidence, except for the inspector’s name, Cadwallader. The singular name, like Prince or Madonna, signifies a level of importance mere mortals do not possess, and Cadwallader is no exception. In The Twilight Zone episode entitled Escape Clause Cadwallader is the name employed by the Devil, a stylish name befitting his self-stylized pomp, who has come to offer a hypochondriac a chance at immortality. Escape Clause aired as the sixth episode of The Twilight Zone on November 6 in ‘59. The numbers 59 sound familiar? They should, they turned up at the end of the service elevator’s permit number. While 11659 would seem more appropriate for the episode in which Cadwallader appeared, the Hollywood Tower Hotel owes more to The Twilight Zone than just a single episode. The State ID Number of 1-259 pays homage to the entire series by alluding to the series premiere, which occurred on October 2, 1959. The Haunted Mansion may be filled with ‘wall to wall creeps, and hot and cold running chills,’ but the Hollywood Tower Hotel has more than enough hair-raising features to frighten guests straight into The Twilight Zone.